In Berlin, when the snow lays thickly on the ground, the temperatures are in the minus degrees and the wind whistles down wide streets biting into any part of you that's not wrapped in a military grade parka (a very welcome birthday present from my Mum & Dad), even going out for cake can be a big effort. Sometimes you just want to curl up with a book or a DVD box set and watch the snow through the window. Anyway, today we were just popping in for a cake-away (do you see what I did there..?) and there was the usual scrumptious looking selection of layer cakes, cheesecakes and other American styled goodies. 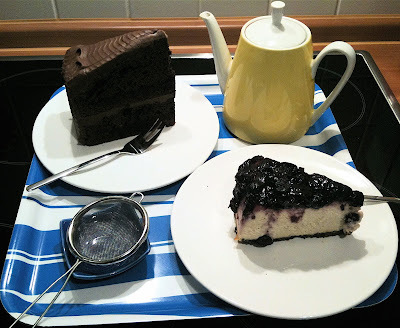 I chose a rather wicked looking Raspberry Ganache Cake, and Coffee Boy was swayed by the Banana & Blueberry Cheesecake. The smiley woman behind the counter wrapped them up for us in that peculiar German way - a cardboard tray with a paper wrapping over the top (I find it extraordinary that a country that takes its cake so seriously packs them in such a precarious way) and waved us goodbye. Feeling pleased with ourselves for thinking ahead to tea time, we trudged home through the snow. When we got back to the flat and unwrapped the cakes I suddenly remembered that the portions were fairly American too! These slabs of cake were huge. In fact we had enough to last us two days. Perhaps they were making the slices a bit larger to ensure they weren't left with any over the New Year. So far so good. I brewed myself an oolong/white jasmine blend and Coffee Boy made a latte and we settled down to a plate of scrumptiousness. Or so we hoped. Sadly the reality didn't quite live up to our expectations. My cake had a really tasty chocolate ganache but the cake itself was a bit bland by comparison, but worse than that it was actually really dry, even verging on the stale. I had chosen it because I love the fruit and chocolate combination but the raspberries were pretty thin on the ground and failed to really make an impact over the ganache. Coffee Boy's cheesecake wasn't much better. For a start it didn't have a crunchy base which alone is enough to put him off; the actual cheesecake was banana flavoured which really didn't float my boat and the topping was blueberry which was full of fruit and, I thought, the best bit. All round though, it was also a bit of a let down - heavy and stodgy and too much of a mix of flavours for my taste. We were pretty disappointed. We have certainly had good cakes from Barcomi's in the past - the chocolate espresso cheesecake was a particular highlight - but this time they didn't excite. Maybe it's the time of year; perhaps the cakes weren't quite as fresh as they usually are; maybe they didn't do well in the cold temperatures. 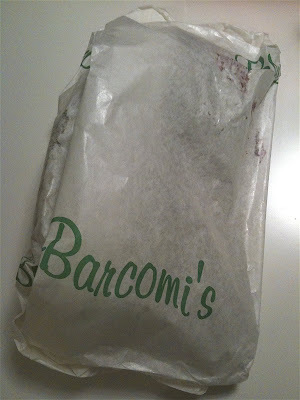 Whatever the case, Barcomi's has slid down the league table of my favourite Berlin cake spots. I will try it again (just to be sure) but probably not for a while. Now, does that count as a new year's resolution? Goodness, all those tasty cakes! I just found your blog through Sarah Chan's blog. 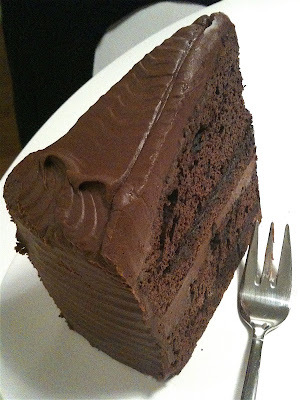 Chocolate cake! Tea! Bicycles ( i have a lovely green Pashley)! 3 of my favorite things! Thanks for following Judith. So nice to connect with like-minded people - wherever they are! I see you're a dog person too. I have a terrier not unlike Sarah's Dougal. Are you also riding your bike through the snow? to begin - Happy New Year! So sorry to hear that you were disappointed with our cakes, what a shame! It is true that the chocolate cake's flavour & texture tends to sieze up in the cold (due to the butter content). If you let it get to room temperature (quite a challenge in this cold weather), the flavour unfolds and the crumb becomes much softer and the taste comes thru quite nicely. The raspberry puree is quite subtle and is meant more of an aftertaste rather than a punch-in-the-palette. So sorry if it didn't reach you. As far as the banana blueberry cheesecake goes, it sounds like the New York Cheesecake would have been a better choice for you:quite simple in its flavour and the crust is quite crunchy. 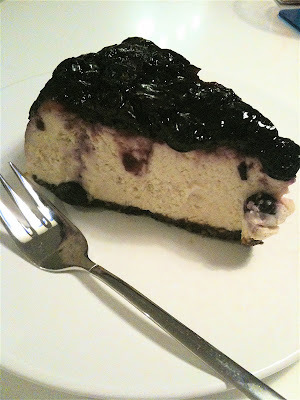 I concieved the banana bluberry cheesecake like blueberries and cream and wanted a soft crust to compliment it. Even if the cakes were sadly not to your liking, I can assure you they were as fresh as can be - we neither have the storage capacity to keep cakes for a long period of time nor are we in a position to over-produce them, not to mention our high quality standards. I appreciate your thoughts about my cakes and welcome any further suggestions you might have. Do try the NY Cheesecake (also with the cherry topping) and let me know what you think. The Apple Walnut Cake is also a dream! How nice of you to take the time to comment on my post. It speaks very highly of your commitment that you care enough to read blogs like mine. It's really good to hear that your cakes are always fresh - I can only imagine that the severe weather we're experiencing here in Berlin took it's toll on the chocolate cake as I walked home. I certainly kept it at room temperature for a few hours before I ate it but perhaps by then the damage had been done by sub-zero temperatures. I had had another cake-away from Kaufhof earlier in the week but theirs came packaged in a recyclable polystyrene-style box which maybe shields better from the cold than the usual German cardboard and paper. As I mentioned, I have certainly been quite the fan of your Chocolate Espresso Cheesecake in the past so I will be more than happy to try the New York Cheesecake next time. The Apple Walnut Cake sounds worth a go too! I will make sure that next time I come I sit in so that I can experience the cakes in their proper environment. I love that you eat cake all the time. Wouldn't it have been so much smarter of Cynthia Barcomi to offer you lunch/afternoon tea on the house the next time you're in Berlin, served personally on a silver platter by the Backfee herself?